You are here: Home / Beverages / Jam Mocktails: Delicious Fruity Fun! Jam Mocktails: Delicious Fruity Fun! But enough about me – Let’s talk about our guest of honor, the one who we are throwing this fun virtual baby shower for: Liz of The Lemon Bowl! She’s soon to have a lemony baby boy, and there’s no better way to celebrate a new life than with a party filled with lemony treats! Jam mocktails are the perfect way to start using up your pantry and fridge staples. Who doesn’t have endless jars of jam in their fridge? Some may be holiday gifts from friends, and others from your latest travels. My lemon-pineapple jam mocktail recipe is inspired by Dessert for Two’s Whiskey Fig Jam Cocktail. No matter what flavor your taste buds crave, with a jar of jam, you can make any flavor of jam mocktails or cocktails you want to! I hope you enjoy this recipe for lemon-pineapple jam mocktails! A lemony, fresh mocktail, made with a jar of fruit jam! Either in a cocktail shaker or in a jar with a small whisk, shake/whisk together all the ingredients. Serve in decorated glass with a wedge of fresh lemon. Cheers! If you'd like to add alcohol to this drink, try adding an ounce of gin. It pairs great with the citrus flavors in this drink. Everyone in the food blogging world has joined in the fun of this virtual baby shower, because heck, we all love Liz! Be sure to check out the rest of the lemony recipes! I used Dehydrated Lemon Peel on the rim of the glasses for the jam mocktails! 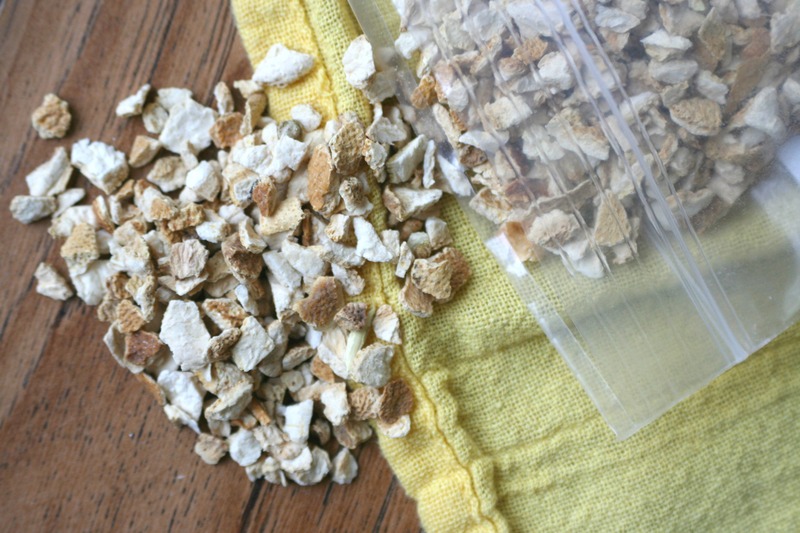 Dehydrated lemon peel is amazing and so versatile; just grab a handful and pulverize it. Then, mix it with some Demerara sugar and you’re good to go. Whipped Feta Spread with Lemon, Garlic & Rosemary, by Miss in the Kitchen. Cauliflower Mashed “Potatoes” in a Lemon Cup with Smoked Paprika, by Climbing Grier Mountain. Lemon Basil Bruschetta, by Dine & Dish. Chipotle Sweet Potato Fries w/ Lemon Basil Aioli, by What’s Gaby Cooking. Lemon Garlic Herb Marinated Olives, by Sarah’s Cucina Bella. Kalamata Olive and Feta Dip with Baked Lemon Pepper Pita Chips, by In Aggie’s Kitchen. Creamy Asparagus Guacamole, by The Healthy Apple. Sparkling Honey Rosemary Lemonade, by Nutmeg Nanny. Basil Hibiscus Lemonade, by Fabtastic Eats. Lemon Jalapeno Spritzers, by Bev Cooks. Sparkling Blackberry Lemonade, by Crumbs and Chaos. Limonana (Middle Eastern Frozen Mint Lemonade), by An Edible Mosaic. Tipsy Lemonade Iced Tea, by Family Fresh Cooking. Kale Salad with Lemon-Tahini Dressing, by Thrifty Veggie Mama. Lemon Quinoa Salad with Pistachios & Sun-Dried Tomatoes, by Cookin’ Canuck. Greek Salad with Lemon Vinaigrette, by Gimme Some Oven. Pear Quinoa Salad, by Reluctant Entertainer. Lemon Avocado Salad Dressing, by The Lean Green Bean. Lemony Spinach & Tomato Quinoa, Salad by MomAdvice. Herbed Calamari Salad with Preserved Lemons, by Everyday Maven. Italian Lemon Roast Chicken Pot by Eat2Gather. Roasted Lemon Garlic Cocktail Shrimp by Simply Scratch. Lemon Garlic Shrimp Tostada by A Zesty Bite. Lemon Pepper Shrimp Linguine by Taste and Tell. Salmon with Lemon Herb Butter by Handle the Heat. Lemon Chicken Stew by FoodieCrush. Chicken Saltimbocca with Lemon Cream Sauce and Olive Orzo by Baker by Nature. Honey Lemon Shortbread Cookies by Rachel Cooks. Lemon Blueberry Macarons by Chocolate & Carrots. Lemon Glazed Cookies by A Cedar Spoon. Healthier Lemon Bars by Texanerin Baking. Lemon Sugar Cookies by What Megan’s Making. Light Lemon Mousse by Country Cleaver. Lemon Sugar Cookie Sandwiches by i am baker. Mini Lemon Cheesecakes with Gingersnap Crust by The Law Student’s Wife. Lemon Cupcakes with Lemon Chips by Seeded at the Table. « Our Favorite Cookbooks Giveaway! Wow this sounds absolutely delicious! Pina colada jam? I need some of that stat! What a fun way to use jam!! So creative and refreshing! I love it and I’m sure Liz would too! What a fun option to have. Hubby doesn’t have alchohol, so I’m always looking for some fun drinks and this looks so fresh and yum. A lemony baby boy? Hehe. 😀 This sounds so good. And I didn’t even know that they made pineapple jam! Mmm. You keep coming up with the most unique and amazing recipes…love this one!! What a fun and fabulous option!! You always have such a fresh perspective on food… I love it! This is brilliant! Pineapple jam… good heavens! LOVE! Such a fun and creative contribution to her shower! Thanks you! Love, love, love this jam! Marnely you are the da’ bomb!! What a great way to celebrate a fantastic lady!! What a combo, girl! Well, now I really *do* want to see you drunk, lol! This looks so refreshing! Thanks for participating in our bash for Liz. Brilliant! I’ve never thought of using fresh jam. So fun! Yes everyone loves Liz! wishing her the best on this new family addition. Your drink sounds fantastic and such a clever idea. This looks simply amazing! I love pineapple and lemon together, just perfect for Liz’s shower!